These are pants made from patterns and fabric I had on hand, since baby pants don’t need too much fabric! I love pattern books. I think they are way easier to understand and follow than commercial patterns. Plus, the patterns are always cuter. Each of these books has a pattern for baby pants. Yes! I had to downsize the pattern for this one since it was made for 18 months + but it worked out great. I even did a real hem by hand. Fancy! This pattern is intended to be reversible, but I just made them one-sided. I used scraps I had from several projects to make a funky pair. Thanks for reading! 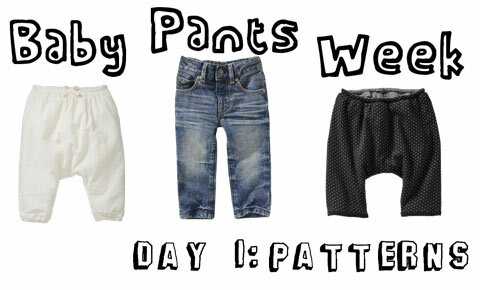 Come back tomorrow to learn how to upcycled old t-shirts into new baby pants! Cool! Those plaid pants are so cute!